Enjoy the mild climate, diverse landscape, stunning bays and fascinating history of this Mediterranean island with your Sixt car hire in Corsica. The island has always been of strategic and commercial importance and over the centuries has been settled by the Greeks, Carthaginians and Romans. Bastia is the capital of the island's Upper Department while Ajaccio is the capital of the whole island. 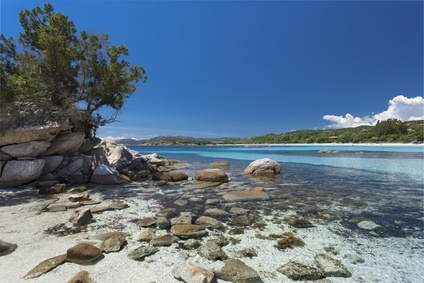 With a car rental in Corsica branch at both locations, we help your island holiday get off to a stress-free start. Our Corsica homepage gives you brief details about branch opening hours and fleets while a click on the grey right-hand tab of the menu bar reveals a map with the exact locations of our airport offices. At both locations, your car hire can be collected from early morning until late evening and returned at any time using our 24-hour facility. Our vehicle category lists are here to help compare prices between car types and show just how affordable our rental cars are. When you are ready to select your rental vehicle simply call our booking hotline or download the Sixt apps for iOS and Android devices. These let you make your reservation on the go. While we guarantee your chosen category of car hire in Corsica we cannot do the same for specific models. Whether you are visiting the island for a weekend break or a longer holiday you will receive a warm welcome from our friendly and knowledgeable branch staff. Our Corsica fleet contains premium vehicles supplied by trusted names such as BMW, Mercedes-Benz, Jaguar and Audi and it is also possible to hire a car adapted for different mobility needs. Compact saloons and larger estate cars, perfect for families, are affordable options for exploring the towns and coastline while rugged 4x4s have no problem with the mountainous roads of the island's interior. Whichever vehicle type you choose our attractive range of optional extras ensures you get the most out of your car hire in Corsica. A Sat Nav helps you reach your destination while baby and child seats make sure children travel safely. As Corsica is a popular year-round destination we also supply snow chains and ski racks along with great deals on additional drivers, insurance extras and unlimited mileage packages. We are happy to welcome younger drivers under 25. At Ajaccio Airport head to the rentals building located in the car park outside arrivals where you will see our desk clearly signposted. From the airport, it takes just 15 minutes to reach the centre of Ajaccio. Our car rental in Corsica desk at Bastia Airport is in the arrivals hall. Bastia Airport is a coastal drive of around 25 minutes from the city centre. As Corsica is a large island rental cars are almost essential to appreciate its variety and beauty. The main road between Ajaccio and Bastia and most of the coastal roads are in good conditions. Narrow carriageways, hairpin bends and possibly animals on the road make travelling slower as you venture onto country routes but the scenery always makes the effort worthwhile. The capital cities and popular resorts such as Calvi and Porte Vecchio become very congested during the peak season of the Summer months and parking spaces can be tricky to find. However, away from the major cities and across the island, parking is easy and often free. To the South of the island, Porte Vecchio is Corsica's oldest resort. 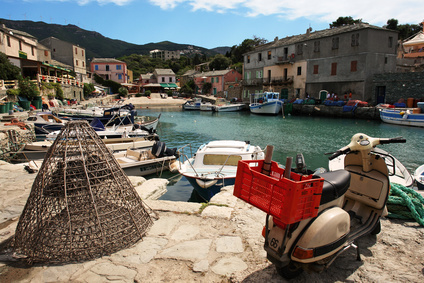 The ancient walled town nestles high up above a modern marina while sandy coves spread out along the coastline. Also in the South is Bonifacio, a dramatic deep water port below crumbling ramparts. This part of the island also has beautiful coastal grottos to visit. Ajaccio was the birthplace of Napolean so enjoy the biographical exhibits and faded grandeur of the Maison Bonaparte house-museum. Bastia to the North is less resort oriented and gives a colourful and vibrant glimpse into contemporary Corsican life while at Calvi a huge Foreign Legion citadel dominates the skyline of this resort town. Here, long family-friendly stretches of sandy beach are backed by dunes and palm trees. 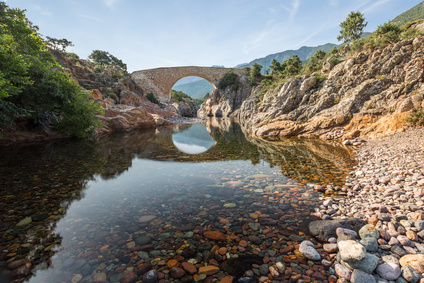 One of the most outstanding geological features of mountainous Corsica are Les Calanches de Piana. These can be found near the village of Piana to the West of the island. Rocky spines start high up in pine-clad forests and over several miles plunge down to the ocean. Either drive along the Les Calanches route stopping to take photographs or find a place to park and hike along part of this impressive formation. Les Calanches is at its most beautiful at sunset. If you want to catch sight of birds such as cormorants, giant gulls and ospreys or marine mammals like seals and dolphins head to Calvi which lies on the edge of the Scandola Marine Nature Reserve and take to the sea on a boat tour. For a fun and educational visit with a difference spend a few hours at A Cupulatta or the City of Tortoises. This unique park provides a safe haven for nearly 200 species of tortoises and turtles from every continent. Meet everything from the latest hatchlings to ancient Giant Tortoises. The whole family will enjoy a day out at Saleccia Park. Once the home of the island's governors these botanical gardens are immaculately laid out with an explosion of colour. While parents stroll through the exotic specimens children can have fun in the different adventure playgrounds dotted around the park. The biggest part of the Corsican economy is tourism with the island's stunning scenery and pleasant climate drawing visitors from across Europe and beyond. A decree in 1584 that ordered all farmers to plant a chestnut, olive, fig and mulberry tree each year has led to the richness of today's chestnut woods. Chestnut bread is still a staple of the island's diet. Agricultural products including gourmet cheese, honey, sausages, olive oil and wine are produced for export along with granite and marble. The modern multipurpose Palais des Congrès et Expositions d'Ajaccio is the island's main exhibition, entertainment and conference venue. Driver's license printed with non-Roman Alphabet (Arabic, Chinese, Japanese, Cyrillic etc) must be complemented by an international driver's licence. For driver's licenses from countries not part of the international driver's license treaty.